-Bring effigies of politicians, bankers or the 1% to burn. Will be music, speakers and fire. -Bring placards or effigies for the route which will pass Lewisham Hospital, still under threat, and other key local places affected by the cuts on our way to the Bonfire. Come to one or all of these acts of civil disobedience against austerity organised by the South East London People’s Assembly. All of them will be family friendly, and welcome participation from everyone. The Floristry and Science departments at LeSoCo (Lewisham and Southwark College) are at risk of closure. These departments have provided our community with excellent services for many, many years. What’s more the college is facing 28 full-time job cuts across the college. Access provision is also under threat and our Learner Services department is now facing a restructure. We are opposed to all compulsory redundancies. Following large-scale support for strike action (86%) and action short of a strike (96%) at LeSoCo, we are taking an hour’s strike action next Weds 17th July over the continuing threat of compulsory redundancies. 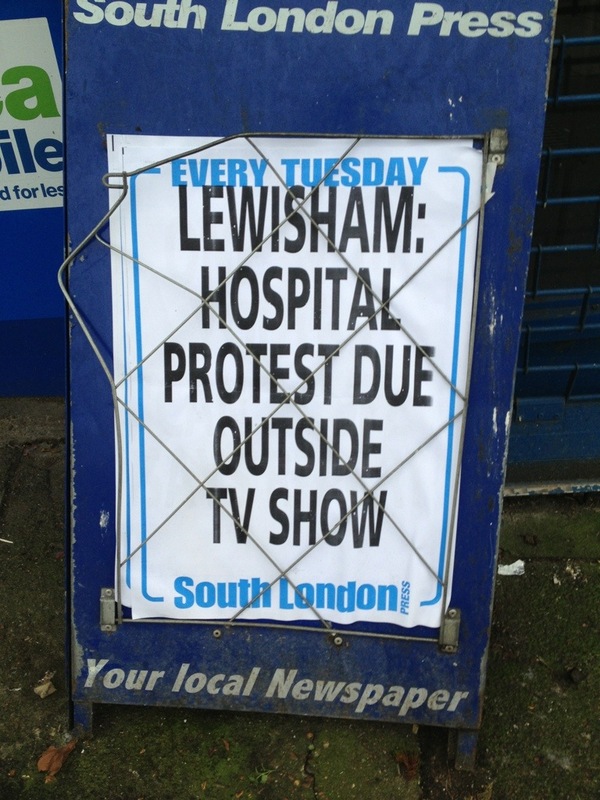 Strike and rally 12.45 – 2.45, Wednesday 17th July, Lewisham Way, SE4 1UT. Please come and bring banners. But the transport links are questionable, the condo thing is a land grab, the capital is dodgy… and the locals upset. John Evelyn’s garden at Sayes Court was one of the most famous and revolutionary gardens of its time. Evelyn’s many visitors included his friends Samuel Pepys and Christopher Wren, and even Charles II himself. Through surviving documentary evidence the garden’s legacy lives on, but the garden itself fell into sad neglect shortly after his death in 1706, and through the vacillations of fate has come down to us today as a corner of the parcel of Thames-side Deptford known as Convoys Wharf. Now scheduled for development, the current owners intend to build directly where the most innovative and influential parts of the garden lay, destroying any future possibilities for discovery. The project Sayes Court Garden is founded on the belief that this crucial piece of our national heritage is not only a once-beautiful historic garden, but also has a vital role to play in the success of the new development for the community at large. 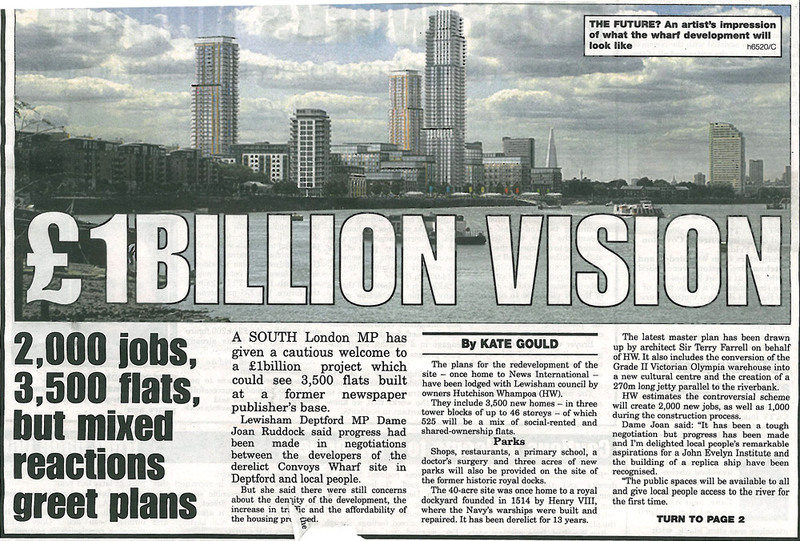 Deptford is now perceived as a deprived neighbourhood of south-east London, classified as an Opportunity Area in the Mayor’s London Plan. The forty acres of Convoys Wharf dominate the river; long closed off to the public at large, at first glance it looks like any other brownfield site in need of some urgent and much welcome development. However, this is not entirely the case. 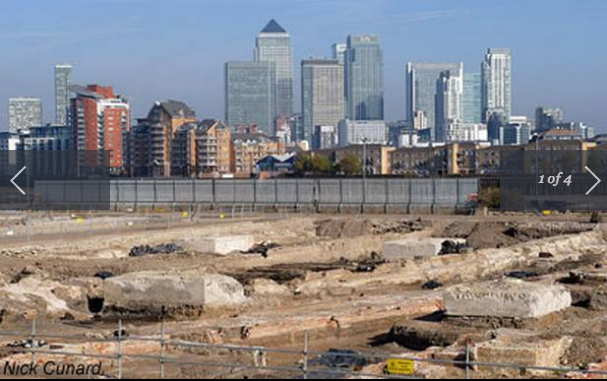 The whole site has a rich history, and just under the concrete skin lie not only the origins of the garden, but also the granite docks and slipways of Henry VIII’s Royal Dockyard, founded in 1513. For 350 years this was the foremost Naval Dockyard in the realm; Raleigh, Drake and Cook all have their stories here. In Evelyn’s time the manor of Sayes Court was walled off from the Dockyard, but they were closely linked. In 1856 what remained of the house and grounds were purchased by the Admiralty and incorporated into the expanding Dockyard. As new ships became too large with the silting up of the Thames, the site was sold. The proposals from the current owners, Hutchison Whampoa, consist of 3,514 new homes in a mixed-use development, to include retail and office space, a primary school and a working wharf. The success and longevity of such a development depends to a large extent on a sensitive response to the site and its surroundings – both cultural and physical. To achieve these aims the design needs to be distinctive and engaging: heritage assets hold the key. Restoring John Evelyn’s garden at Sayes Court would bring immeasurable benefits to the area, and stimulate interest and recognition from around the world. Along with the potential to mark Henry VIII’s Dockyard on the same site, this neglected corner of London could become a tourist destination in its own right, complementing nearby Greenwich along the Thames Path. For the neighbourhood itself, this extraordinary garden could help to define the character of the new development, giving a strong sense of identity and becoming a source of local pride. One of the most exciting aspects of the project is the garden’s capacity to function as an open space under the democratic guardianship of the community: a new “common”. It would be a place of delight and beauty for everyone to enjoy, a challenge to the trend which sees access to our exceptional heritage reserved for the wealthier boroughs. Planting the numerous trees and medicinal herbs would bring sorely needed and ever-increasing advantages to health and the local environment, and the garden could become once again the setting for experiments and research. All in all, it would be a fitting remembrance for two great and generous-hearted men who dedicated their lives to improving conditions for all strata of society: John Evelyn himself and also his descendant, William John Evelyn, who donated his ancestor’s garden to the people of Deptford. After everything that has since passed, it is proper that it should belong to the public again. Hutchison Whampoa need to be persuaded that these benefits outweigh any difficulties in re-structuring part of their design or possibly losing a small portion of building land. The current proposals completely ignore Sayes Court Garden, and support is urgently needed if this unique piece of London’s past is to be saved – to become part of our future. 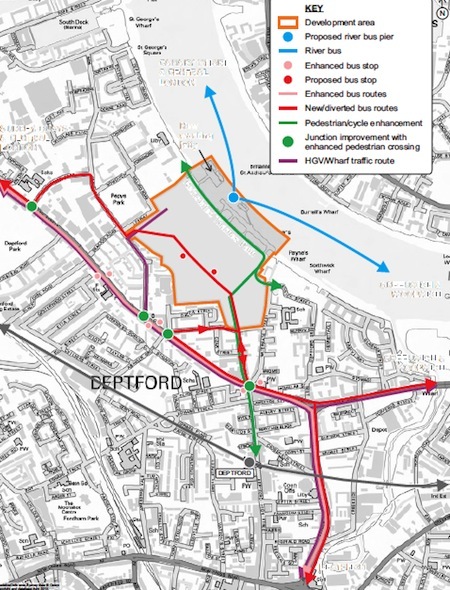 Deptford is… – post on Convoys Wharf transport issues. One of the strongest arguments against allowing Convoys Wharf to be developed to the density that Hutchison Whampoa is suggesting, is the fact that the public transport accessibility of the site is so poor. This situation has not improved with the new masterplan, so many of the comments made in our last assessment still apply. Many of the people living in these new properties will have to travel into London for work on a daily basis, so how will they do this? Planners measure public transport accessibility by measuring it on the PTAL (Public Transport Accessibility Level) scale. 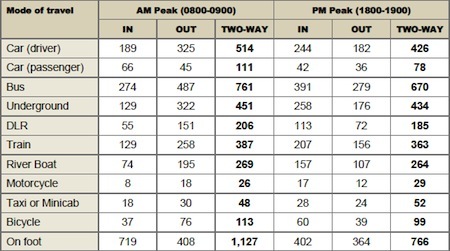 This provides an assessment of how easy it is to get from the site to public transport, and ranges from 1 to 6, with 1 being the lowest rating and 6 the highest. In London a rating of 4 is generally a good level for major developments such as this to aspire to. The PTAL rating of Convoys Wharf ranges from 1 to 2 across the site, with 2 being the level at the exit on Princes Street. With Hutchison Whampoa’s plans for redevelopment, the rating will rise very slightly, but will still be an average of 2 across the site, and 3 closest to Princes St. The diagram below indicates the transport plans for the site – in simple terms, HW is in discussion with TfL about the possibility of having a pier for the Thames Clipper river bus, and also proposes either a new bus through the site, or the diversion of one of the existing services that go along Evelyn Street, the 199 having been suggested. For a Thames Clipper service to call at the site will require the refurbishment of the existing jetty and the construction of a new pier on the jetty. Although TfL has acknowledged the possibility of a new pier at Convoys Wharf, there is no firm commitment to a date other than during phase one, which is five years long. There is also no confirmation of whether the service would be the regular London-bound boats, or just a shuttle boat to Canary Wharf.In either case, use of the riverbus service is impractical for many people – not only in terms of its restricted capacity, but also because it serves so few destinations and is slow in comparison to other public transport options.Aside from the bus and boat services, future residents at Convoys Wharf will have to travel somewhat further afield to access trains or DLR services. Naturally Deptford station is the closest train station to the development, and as the transport strategy points out, the station has recently been refurbished. But although the station is now more pleasant to use and easier to access, and the capacity of the station itself may have been increased, there has been no change to the capacity of the actual trains.The analysis of available capacity on services from Deptford station depends heavily on completion of Crossrail in 2018; this is predicted to reduce the number of people using London-bound trains from Woolwich, and is entirely credible. However there is no reference to the most recent Office of Rail Regulation figures which showed Deptford station experienced 7.1% increase in usage last year, and this is expected to continue as redevelopments continue and residents move into the new properties.According to the trip generation figures, 258 people from Convoys Wharf will take the train towards London in the morning peak hour between 8am and 9am. This seems a very low figure considering the total population that could number 10,000 or more. But even taking this point aside, the addition of around 44 passengers to each already-overcrowded train is not a pleasant prospect.Bus services are also likely to suffer – while the transport plan envisages a bus route through the site, there is no firm commitment to a new service as yet, so it could well be an existing route diverted and hence making journeys longer and more overcrowded than they are now. Almost 500 people from the development are estimated will be catching the bus during the morning peak hour, many presumably going towards Underground or Overground services elsewhere. Meanwhile less than 200 will catch a river bus, although with only four services in the peak hour, that’s still an estimated 50 per boat. The boats in the current fleet each have 220 seats. Does it matter what’s underneath the pavement? Under our feet, in the earth, are the traces of the 2,000 years of Londoners, their coins and clothes, their trinkets and tools, the remains of their buildings and roads. The question of whether this material, this soup of memories, should have any bearing on how our city develops is an open one for those building our city today, and one that has sparked an argument over the massive Convoys Wharf site in Deptford, which I visited last week. If Hong Kong developer Hutchison Whampoa gets its way, this 16-hectare riverside plot (the size of about 20 football pitches) in the borough of Lewisham will soon be home to 9,000 people in 3,500 homes, with a new school, shops and space for “cultural uses”. So far, so good. But this isn’t just any slice of the river. Convoys Wharf was formerly the King’s Yard, built by Henry VIII in 1513 as London’s military dock and known across the world. It was the harbour to royal yachts, where Francis Drake was knighted aboard the Golden Hinde in 1581, and where Elizabeth I’s Spanish Armada-defeating fleet was built. It is a place of astonishing, nationally important historical significance. Greenwich, just a mile down-river, with its colonnaded Old Royal Naval College, has become a world heritage site and will officially become a “Royal” borough next year. But it was Deptford that built the boats that made England powerful enough to conceive of and fund that architectural setpiece in the first place. The plan submitted by Hutchison Whampoa is a regulation piece of urban design by commercial architect Aedas. It’s pretty uninspired, with the usual precision about residential unit numbers but vagueness about the kind of public life that might be found there. But the plan tries hard to link into its surroundings, and the proposed development will be much better than the gated communities of riverside west London. There is a recognisable street pattern, a bus route through it, along with a school and an attempt to make a high street with a mix of uses. Broadly, the plan is based on work in 2005 by Richard Rogers, whose principal insight was to try to continue the line of Deptford’s high street towards the riverside. Perhaps most importantly, it also proposes public access to the riverside here for the first time. But a group of local people accuse Hutchison Whampoa of recklessly ignoring the historical remains, and are pleading with the developers to reconsider their plan. They say the site should be given back more of its original character, that ancient remains below the ground should be available to public view, and that water should be reintroduced to the site by digging out the former Great Basin of the dockyard. Chris Mazeika, who lives in the Master Shipwright’s house on the eastern side of the site, is part of a network of local bloggers and campaigners asking questions of Hutchison Whampoa’s proposal. He believes that there is something important about the history of the site that should be drawn out by revealing the remains or perhaps echoing the original layout of the dockyard. The site today is rather eerie, a huge expanse of concrete with a few Sixties and Eighties warehouses still standing. There are no roads and no sense of how it all once fitted together. The riverside is spectacular, though. The wharf juts out into the river and the view from it takes in a vista from Surrey Quays to the west and Greenwich to the east. This timber platform will be transformed into a public park in Hutchison Whampoa’s plans, complete with river bus stop. The Grade II-listed Olympia Warehouse (built in the 1840s) stands in the middle of the site, slightly askew to the riverside, a magnificent iron structure most recently used by Lewisham council as a storage facility for wheelie bins. It is the only historic building left above ground, and the proposals designate it vaguely as a “covered public square”. They aspire to something along the lines of Spitalfields Market. This all feels a bit sketchy at this stage, and the developer’s preference is to retain just the beautiful iron frame, perhaps adding to it a new glass envelope. In anticipation of these remains being covered up by the new development, a huge archaeological dig is under way between the Olympia Warehouse and the river. The foundations and remains of the huge Tudor storehouse and the docks are clearly visible in the trenches. Two slipways, complete with timbers used to brace and support ships as they were constructed, look amazingly complete to my untrained eye. All this will be recorded, then covered over again and the new residential buildings built over the top. The remains will never be seen again, or at least not until Hutchison Whampoa’s buildings are themselves demolished, which could be 200 years away at London rates of replacement. It must be said that the King’s Yard has long lost its Tudor character. Since the Second World War, successive idiotic owners chose to demolish the remaining buildings on the site and fill in the basin and slipways. Most jaw-dropping of all is that in stages between the Sixties and as recently as the Eighties, a Tudor storehouse was demolished and its foundations concreted over so that huge distribution sheds and warehouses could be built. It is heartbreaking that so much has been lost. None of that is Hutchison Whampoa’s fault. The group and its architects see Convoys Wharf as an opportunity to create a residential quarter they believe will be “modern and positive”. The architects say that the arrangement of the proposed apartment buildings perpendicular to the river somehow mirrors that of the historic slipways, and a proposed park on the site of the former double dry dock will evoke the history of what’s underneath, perhaps by using materials that suggest its former use. That to them is enough. My visit to the site convinced me that while the developers are very aware of what lies beneath, they don’t feel it of sufficient significance to prevent or slow London’s development. Aedas and Hutchison Whampoas have made a judgment that to preserve any remains for public view, or to reintroduce water into the site (as the Rogers plan proposed) would be uneconomical and (they told me) would be a hindrance rather than a help to make it a better place to live. As for the campaigners, they are vague about what they are calling for and appeal to notions of memory, meaning and history that are not part of the usual property development vocabulary. Mazeika, like many of us, finds it difficult to describe exactly what difference it makes to resurrect ancient street patterns, to uncover old docks. He favours gradual, incremental development, but that is never going to happen with such a large site under single ownership. This seems an unbridgeable intellectual gap in today’s London. The nuanced understanding of the place that the locals advocate here in Deptford is mirrored all over the city by local interest groups, amateur historians, and concerned residents near large regeneration projects. But it has no way of gaining traction in a development process involving this much money, and that is a failure of our planning system and of imagination of the politicians who are the guardians of our city. I respect Hutchison Whampoa and Aedas for trying to make a decent, mixed place that links into the surrounding community. I think (unlike some Deptford residents) that the scale and character of the spaces around the Olympia Warehouse will be fine, certainly better than the meaningless public spaces at equivalent developments of a decade ago (Paddington Basin comes to mind). The quantum of development, and its skyscraper-scale apartment towers, aren’t a problem to me, and the new public space by the river almost can’t fail to be enjoyable. But in deploying standard urban design tactics the masterplan does find itself ignoring what makes this place special in the first place. I suspect the history of the site will be signalled in branding and signage more than any real, physical or spatial sense. And while it is a very difficult task to capture all these historical and cultural layers of a city in urban design and architecture, good architects should be able to do it.